Saturday, April 13th, 6:45 p.m. Released in 2006, this extended director's cut of the much-loved What the Bleep Do We Know!? explores in depth how possibilities are endless, and so is the fun! Academy Award winner Marlee Matlin is Amanda, a photographer suddenly transported into a metaphysical world of quantum mechanics, odd science and mind-bending phenomena. Guided by the world's top physicists, engineers, biologists and mystics, she tumbles down the rabbit hole and gets a first-hand look at the fascinating links between science and spirituality in our everyday lives. Filmed around the Portland area, the evening's viewing promises to be exiting for first timers and What the Bleep!? veterans alike. Saturday, April 13th, 6:45 p.m. seating; film starts at 7 p.m., Cascadia House, admission: Free. Any donations for time and expenses are appreciated. First-come, first served. Please reserve your space(s) on our website so we know that you are coming, and please only reserve a place when you are truly attending in consideration for others and your hosts. The private Vancouver residence address will be given upon sign-up. Please bring a pillow to ensure your comfort, and a healthy finger food or beverage to share. Come and meet like-minded spiritual and metaphysical community at the Cascadia House Conscious Cinema gatherings held monthly. We have a brief social meet-and-greet and show a film chosen specifically nourish our spirits -- whether comedy, drama, documentary, or ??? We're open to your suggestions! There will be an intermission to mingle, meet, and discuss. After the film we'll continue the discussion, and simply socialize! The Cascadia Room has a theater screen with HD projector and high-quality sound. We can seat about 18 people on backjacks (which are floor seats), as well as snuggly foam mats and pillows so you can recline while watching. 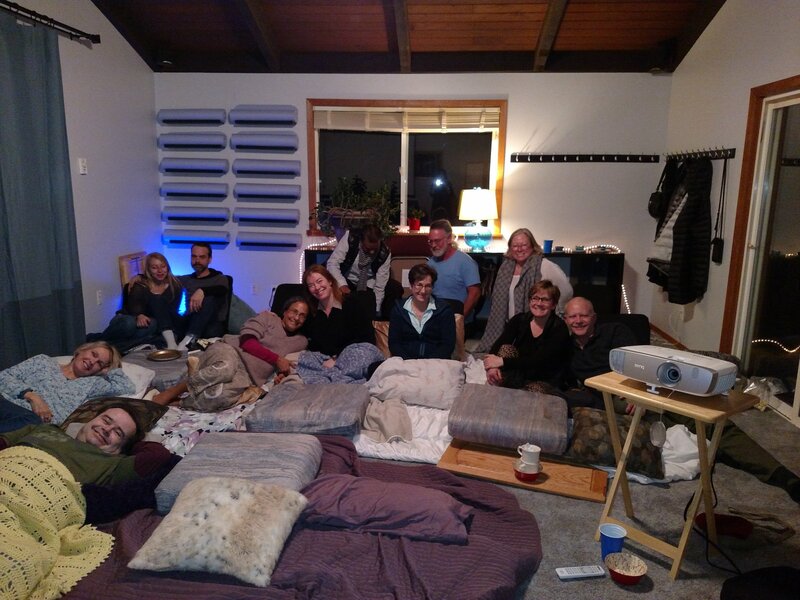 Pictured here is the group of 14 delightful souls who attended the inaugural first showing of a movie at Cascadia House, which was Wayne Dyer's The Shift during January 2019.